If the current of directional control valve solenoid is constant, the coil turns from 100 to 200 turns, its magnetic what will happen? It is possible to speculate: two 200-turn coil by a combination of 100-turn coil, each coil produces a magnetic field, two of the same field together, wet magnetic solenoid valve increases. Through the above speculation can think of: Wet valve solenoid coil turns, the more, the greater the current through the wet magnetic solenoid valve will be stronger. When the coil is energized, the core and the armature magnetized, as two magnets with opposite polarity, the electromagnetic attraction between them. When the suction is greater than the spring reaction force that the armature core starting toward the direction of movement. When the coil current is less than a certain value, or uninterrupted power supply, the electromagnetic suction is less than the spring reaction force, the armature reaction effect in the return to the original release location. Solenoid valve is the use of wet carrier core electromagnetic coil suction to manipulate the mechanism, is expected to complete an electrical action. It converts electrical energy into mechanical energy of a magnetic component, mainly by the solenoid valve coil, core and armature of three parts, the armature core and soft magnetic materials for general use. Core is generally static, the coil is always installed in the core. 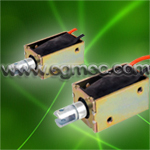 Switch electrical appliances Wet armature solenoid valve is also equipped with spring! With internal core, and the use of a current through the coil it like a magnet with a magnetic device called a wet solenoid valve, usually made of strip. Core magnetization easy to use, easy to disappear magnetic soft iron or silicon to the system to do. This wet solenoid valve when the magnetic power, power outages after the disappeared. Wet solenoid valve has many advantages: Wet or absence of the magnetic solenoid valve can be used to pass, off current control. The size of the magnetic current strength can be the number of turns or coils to control. Wet valve solenoid in daily life has an extremely wide range of applications. Wet valve solenoid is current magnetic effect (Electro magnetic) of an application, and life is closely connected, such as electromagnetic relays, electromagnetic crane, magnetic levitation trains.